Public Improvement Bonds are general obligations of the Commonwealth for the payment of which the good faith, credit and taxing power of the Commonwealth have been pledged. Their payment constitutes a first charge on all available revenues of the Commonwealth. Commonwealth law provides for a special sinking fund for the orderly payment of debt service on these bonds. The Commonwealth also has outstanding Tax and Revenue Anticipation Notes, payable solely from taxes and revenues in the General Fund collected after the issuance of these notes and prior to the end of the fiscal year for which they were issued. Neither the good faith, nor credit, nor taxing power of the Commonwealth is pledged for the payment of the debt service of these notes. The Commonwealth has a broad-based revenue structure. Leading sources of tax revenues are personal and business income taxes, sales and use taxes, excise taxes on consumption articles, property taxes, and Federal excise taxes on liquor exports that are returned to the Commonwealth Treasury. 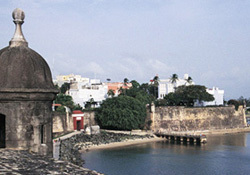 Puerto Rico also receives Federal grants for various government programs. The Commonwealth government assumes responsibility for police and fire protection, education, public health and welfare programs and economic development, and supervises municipal fiscal affairs. The Constitution of the Commonwealth provides that no additional direct debt may be issued or additional guarantees extended if the principal and interest payments for general obligation bonds and notes due in any fiscal year, together with any amount paid by the Commonwealth in respect to its guarantees in the preceding fiscal year, exceed 15 percent of the average annual general revenues of the Commonwealth for the two preceding years. This debt limitation has never been reached.